This interesting surname is of Anglo-Saxon origin, and is a locational name either from a place thus called in the West Riding of Yorkshire or from Kettlewell, a hamlet north west of St. Albans in Hertfordshire. The former place, recorded as "Chetelewelle" in the Domesday Book of 1086, as "Keteluella" in Yorkshire Charters, dated 1173, and as "Ketelwell" in the 1222 Feet of Fines for that county, was so called from a Scandinavianized form of the Olde English pre 7th Century "cetel", deep valley, with well(a)", spring, stream. The latter place also has "cetel-wella" as its naming elements. Locational surnames were originally given to local landowners, and the lord of the manor, and especially to those former inhabitants who left their place of origin to live and work in another area. Early examples of the surname include John Ketelwel and Alessander Katelwell, noted in the 1379 Poll Tax Returns Records of Yorkshire. On January 5th 1563, Joseph Kettlewell and Margaret Sandeman were married in Settrington, Yorkshire, and on June 12th 1565, John Kettlewell married an Elizabeth Bellingham in Chipping Barnet, Hertfordshire. Notable bearers of the name were John Kettlewell (1653 - 1695), devotional writer, and tutor of Lincoln College, Oxford, where he received an M.A. 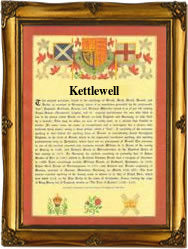 in 1677, and Samuel Kettlewell (1822 - 1839), licentiate of theology, Durham, 1848, M.A., 1860 and D.D., 1892. His publications include works on Thomas a Kempis and other theological writings. The first recorded spelling of the family name is shown to be that of Stephen de Ketelwelle, which was dated 1272, in the "Records of Yorkshire", during the reign of King Edward 1, known as "The Hammer of the Scots", 1272 - 1307. Surnames became necessary when governments introduced personal taxation. In England this was known as Poll Tax. Throughout the centuries, surnames in every country have continued to "develop" often leading to astonishing variants of the original spelling.